c/o Community Health Center of Middletown. Mark Masselli, left, and Gov. 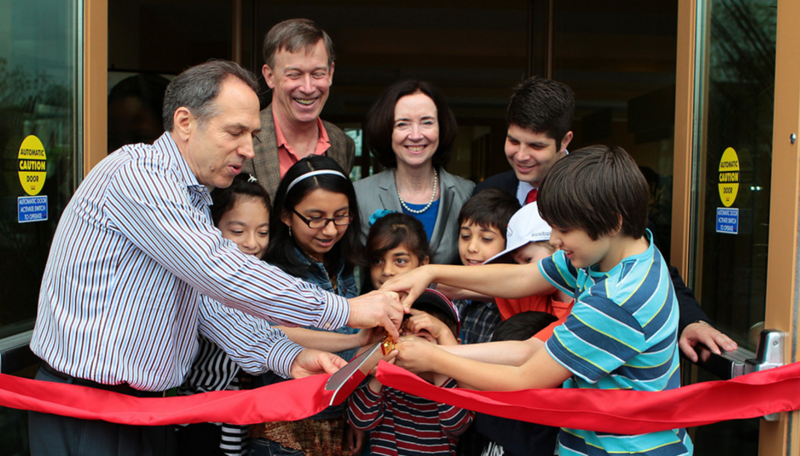 John Hickenlooper ’74, second from left, at a CHC ribbon cutting ceremony. So integral to the Wesleyan and Middletown communities that he is often mistaken to be an alumnus of the University, Mark Masselli (H ’09) has grown the Community Health Center from a startup among friends—such as Governor John Hickenlooper ’74—to one of the largest forces in healthcare nationally and globally. Before scaling his operation to one of the largest healthcare providers for low-income and uninsured patients, Masselli grew up on campus with his father, who was a chemist at the University. Growing up in the Butterfield era through the increasingly radical ’70s, Masselli has seen the evolution of both the University and Middletown. Sitting in the pristine common area of the top floor of the Community Health Center in Middletown, which has a view of the city so compelling that he calls it “the Upper West Side of Middletown,” Masselli reflected on growing up on campus and how the University’s ethos informs his current work. That community organizing led Masselli to found the Community Health Center when he was only 19 years old. At the time, the CHC was a startup before the term had become ubiquitous. For Masselli, he firmly believes that despite the center’s current size and scale—serving over 145,000 patients in the state of Connecticut—it still behaves like a startup. Much of what informed this approach came back when he was coming of age on campus during the Open Summer. Integral to the formation of the Community Health Center was the phenomenon of lost youth fleeing to places like San Francisco without any healthcare. Writers like Joan Didion have chronicled the disarray and decay that came with what was ostensibly a liberating experience. Masselli couldn’t help but try to do something after he got word of what was going on in neighborhoods like Haight-Ashbury. This model would later become the foundation of the Community Health Center’s philosophy of providing care to those who can’t afford it, which will be detailed further in Part Two. As Masselli’s time in Middletown progressed, so too did the look of Main Street and its attraction of Wesleyan students. Whatever students’ varying opinions of Main Street are today, Masselli witnessed a period in which almost no students wanted to venture two blocks down from campus because the downtown had fallen so precipitously from its hay day. More importantly for Masselli is how Middletown brands itself in the presence of the University. Next Tuesday in Part Two, Masselli will outline what makes the Community Health Center a national and global leader in affordable healthcare, and how Wesleyan’s ethos informs that work.